It takes a bit of practice to roll sushi perfectly, so don’t worry if you don’t get it right on the first try. (I sure didn’t!) Just keep trying, and keep in mind – even if they don’t look great, they are still edible! Mistakes taste just as good as perfectly rolled sushi. If you prefer to make inside-out maki rolls (uramaki sushi), see my How to Roll Inside-Out Maki post. Place about 1/2 cup of sumeshi on the nori. Wet your hands with water so the rice won’t stick to your hands. I find it’s useful to have a small bowl of water sitting next to my work area so I don’t have to keep running between the sink and my work area to keep my hands wet. 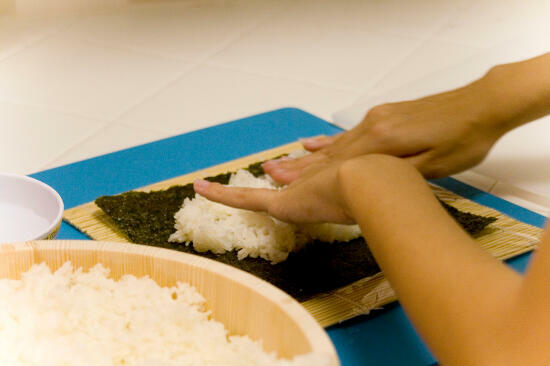 Spread the rice over the nori with your hands, leaving a 1/2-inch strip of nori uncovered at the bottom. 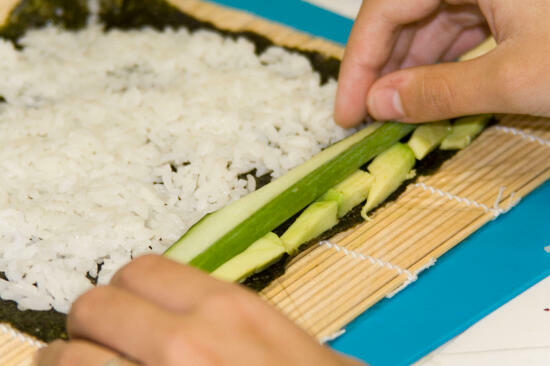 Place your desired fillings along this strip of uncovered nori on the edge closest to you. 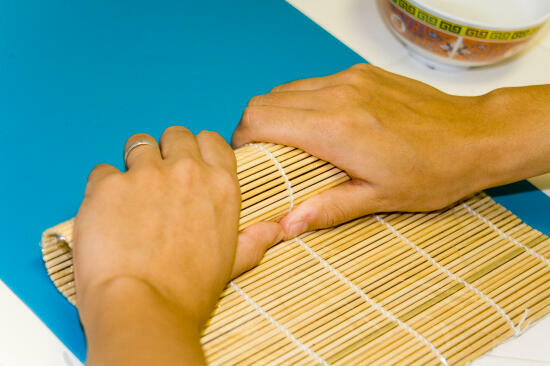 Using the rolling mat, begin to tightly roll the sushi. Start at the side nearest to you, and roll away from you. Make sure you don’t roll the rolling mat into your sushi! 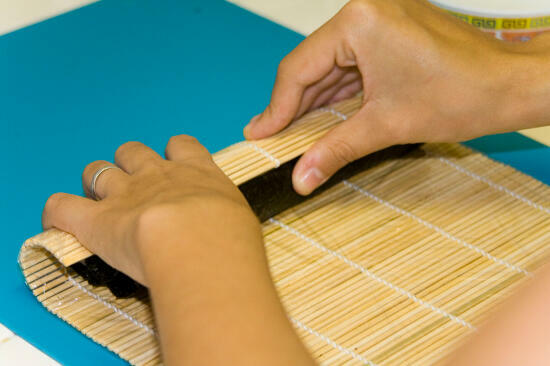 Using a very sharp knife, cut the sushi into six or eight pieces, depending on how thick you like your sushi. It helps to have your knife freshly sharpened; otherwise it’s pretty easy to squish your sushi when you are cutting it. This can cause the sushi to fall apart when you are eating it, and become kind of a pain. Also, it helps to wet your knife before cutting the sushi, so the rice and fillings won’t stick to it. WARNING: Please be very careful using the knife! Do not allow children to use sharp knives, and keep fingers and other body parts away from the blade. I am not liable for any injury you might incur while using knives or other sharp objects. this is a great post, i like how its so easy to understand! now i cant wait to make some sushi at home 🙂 i love your sushi blog! Thanks, for the guide, I always wondered how they made it, now I can try it for my self. Looking at this guide is making me shushi hungry! The hardest part about making sushi for me is finding the fresh fish. Any tips on how to find sushi grade fish? I go to my local monger and he usually only has tuna that is fresh enough to eat raw. It’s impossible to find yellowtail. Julie – I’m glad you like it! By the way… if you like my blog, be sure to subscribe to our rss feed!! It’s an excellent way to present different food. It’s one way to understand another culture. The sushi presentation and the touch of it is great. Thanks for the time you spent with this sushi walkthrough, the pictures help a lot. I am going to shop for Nori. neon – You’re welcome, it was my pleasure! Thank you for sharing your knowledge. My wife and I were able to attend a sushi 101 class at Whole Foods Market last year and have made sushi about once a month since. I love the way you have divided up the steps and included pictures, similar in style to DK publishing cookbooks. Very helpful! 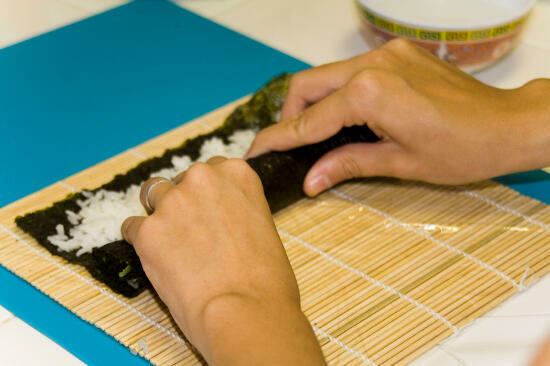 Personally, I find it easier to make urimaki (rolls with the rice on the outside). 1. Cover the mat with cling wrap before rolling to prevent it getting dirty. 2. Keep the knife clean and wet it before cutting the sushi to prevent sticking and get a nice clean cut. I’m off to the supermarket now to buy some nori! Thanks for the inspiration. might want to note that sushi rice isn’t just rice. it’s rice + wine vinegar at the least, sometimes salt added, too. it gives the rice added flavor, which can be pretty critical. the above recipe is more for korean sushi or ‘kimbob’ .. that uses plain rice. Mike – Oh dear… I hope not! I like my sushi… but at least we will still be able to make non-seafood sushi still, although I will definitely miss the seafood if that happens! Screw sushi.. Kimbap is where it’s at!! rast – I may just have to make some Kimbap, since you think it’s so good! 🙂 Perhaps there will be a post about it here sometime soon 😉 Do you have any recipes you would like to recommend? I’d never really thought of making my own sushi before. But I imagine this is so much better than buying packaged sushi from the local supermarket. 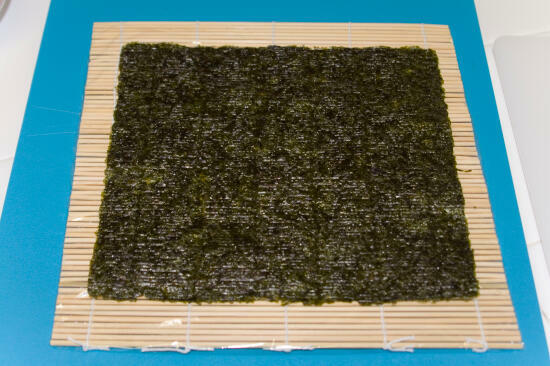 The only problem is that I haven’t seen anywhere selling the sheets of nori. Sally – I have seen nori at Ralphs and Albertsons before, in the Asian aisle. The nori that I have seen there is usually folded in half, so the package is only half as wide as a normal package of nori. If you can’t find it there, maybe there is a Japanese or Asian market near you? Hopefully you can find some nori and make some sushi! 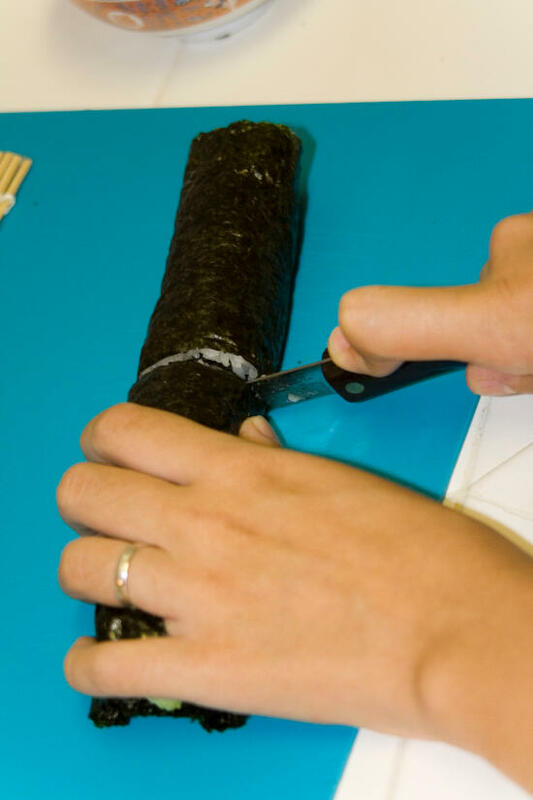 There are two methods to stop the sushi unrolling itself. 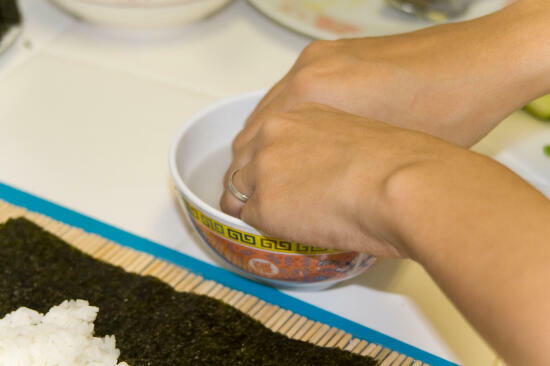 At the end of step 6, use a little water to dampen the exposed edge of nori, or crush a few bits of rice along the edge. Just like a roll-your-own cigarette. meat_chris – Thanks for the tip! WellÃ„Â° I’m not interested in making my own sushi, i like only eating sushi but one thing I couldn’t pass without saying anything about is design of your web site is awesome, I mean if only all sites on the internet were smooth like this. Thank you. Pingback: iDiy.mobi » Roll Your Own Sushi! re:cutting the sushi without squishing. we find that a bread knife works well! My sushi turned out quite good, but that Nori is too fishy and snake like. What else can I use? You can try making the Inari-Zushi or use wrappers such as a spring roll wrapper, or anything flat and thin, depending on which roll you are making. Some might work with tortillas, crepes or egg omelettes, although I haven’t ever tried any of those so I can’t tell you which rolls would be good with them. Good luck! Pingback: Riley Central » Archive » Sarah and I are Making Sushi! What a concise and informative article with excellent pictures! I paid $55 for a sushi workshop and we didn’t even learn how to roll the sushi, so finding this page is great. 🙂 Thanks for the information! Love the stop by step pics! Thanks for your help. 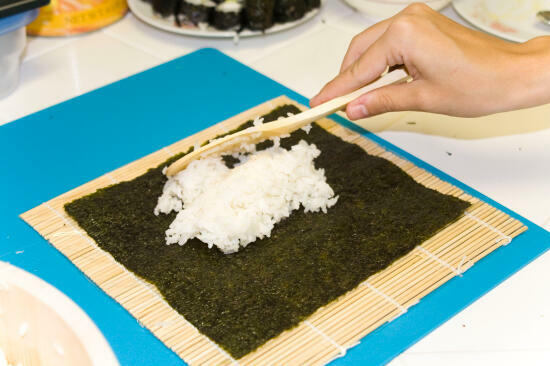 Thanks for giving the amount of rice to place on one sheet of nori. I searched many other sites without success for this information! Anon – You’re very welcome. The way you suggest rolling isa very basic style. 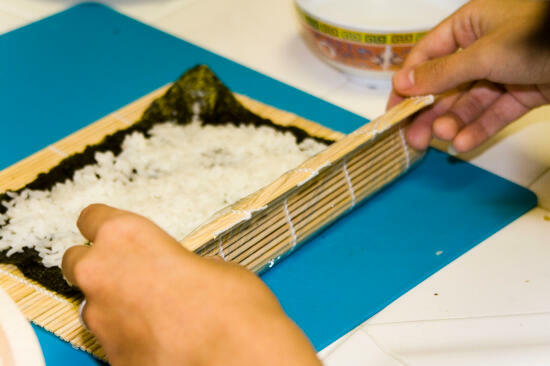 If you want to roll more like a real sushi chef then use a half sheet of nori, cover it completely with sumeki and place your filling on thefirst half closestto you. Then roll tightly. Use the mat by placing it over thetop of the rolled sushi andpress the top and twoside making a square that will seal everything in. Make sure you stop rolling just when the two edges meet or you’ll end up poping the roll and that’s just a mess. Then use colored flying fish roe to color the tops if you want to make them inside out, just rememberto turnover the nori/sumeki sheet BEFORE you fill it. Hmm delicious. I am actually going to be assisting in such home-made sushi preparation and of course I would love to help thiose who are organizing them. I am quite clumsy when it comes to kitchen so I’m afraid I’ll waste something. I will want to try doing this one day for myself only once I find proper ingredients. It’s not easy to find the kind of rice adequate for sushi around these parts. Anyhow, I LOVE your guide. Very informative, very clear and simple. Thank you! All the best and good luck in your further sushi adventures. About the knife / cutting – There’s nothing to be afraid of. For one, you’ve already covered the fact that it should be sharp, as that’s the safest. The other half is just how you use it. The proper and safest way to cut is to hold it right. 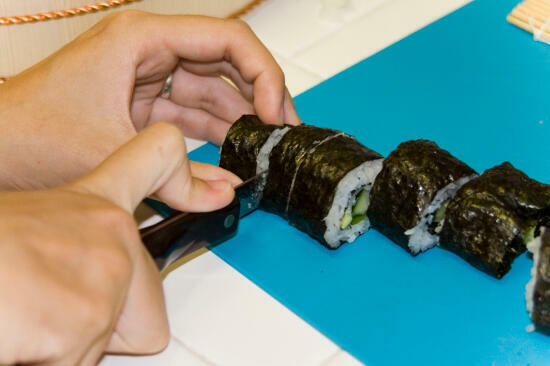 Lay your hand with your fingers perpendicular to the way you’re cutting (along the sushi roll). Then curl your fingers and bring the tips together such that all of your finger nails are forming a nice little wall between where you want to cut and your precious fingers! Then cut, using that “wall” to protect yourself. Your nails can take it! And have fun, as Allison is encouraging us all to with her wonderful recipes! For the traditionalist, it’s important to use an odd number of fillings; even numbers are bad luck. I think the best thing about the sushi is the mixing of the wasabi with the soy sauce so that it is not too hot, but not too mild either. The wasabi is really healthy also. nihongo geek – Thank you, and I’m glad you found this guide helpful. Pingback: What are some healthy tasty Japanese recipes? Wow I wish I could get into cooking , mmm. I sure love some these lol. I am a DJ , just don’t have time , only with music. But food cooking is an art too! Great share. I like to use eel (kabayaki type) and vegetables for the ingredients! I remember when I lived in Tokyo, I lived in a guesthouse with mixed gaijin (foreigners) and Japanese. Me and my buddies were always trying to make sushi, and I’m not kidding, the Japanese roommates didn’t even try any of it until we had made it at least 15 times. It turns out to be a sushi chef training under a true master, you have to watch, learn, and clean for over 6 months before you are even allowed to make rice. No wonder our roommates were loathe to try ours, a bunch of Canadian guys who could barely use chopsticks, LOL. After a bit of practice I’m not too shabby now, though. I have rolled sushi once before, but you have inspired me to try it again. Maybe tonight for dinner, hmmmm. Thanks! Pingback: Sarah and I are Making Sushi! DJ White Hawk – You should definitely try if you have the time – it doesn’t take a huge time commitment, and the end result is totally worth it. YouLin – Thanks! I agree, those are delicious. Suzy – The nori should be dry when you put it on the mat – sometimes I even hold it over a flame for a few seconds to crisp it up even more. You don’t want it to get soggy, otherwise it will be difficult to work with and hard to eat. Maki sushi is very delightful. hello have are you man good web page. I cut myself with the knife! I’m holding you personally liable! I loved the sushi although, I don’t recommend eel in it! I just like cucumber!!! Nevermind what I just said!!! O yeah, i love sushi and it’s not so difficult to make it.